At the end of February, I was going to be attending an event called Workbench Con in Atlanta, Georgia. This is the 2nd year for this event, and last year was so much fun, as soon as the tickets went on sale, I picked one up. Many people hand out stickers of their logos and swap with other makers, but I didn’t have any stickers. I wanted to make some leather logo patches as a project, so I decided to just make some extras to pass out while I was there are Workbench Con. They were a big hit, and I only regret that I didn’t have more! I started out with whole sides of leather. A side of leather is typically a large roll, depending on the type of leather. These sides were from cattle, so they were 20 or more square feet each. I cut out a few pieces in different types of leather I had, and then used some painter’s tape to mask off the top. 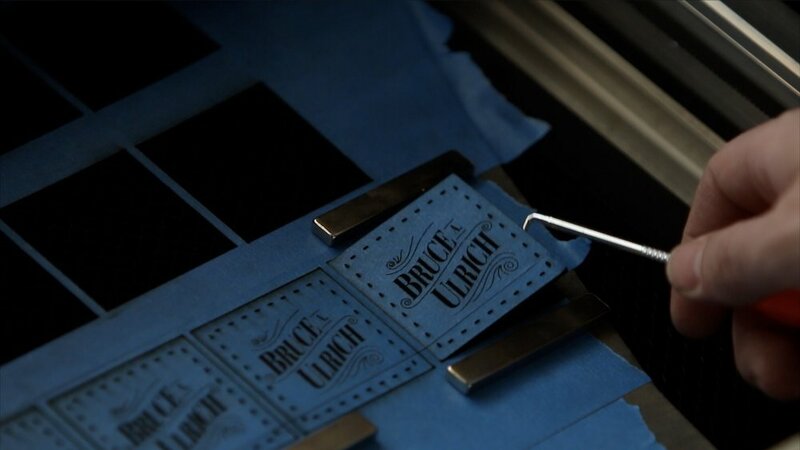 When using the laser engraver, this will often save time trying to clean off a smoke stain later. If you want to know more about where I buy my leather and where I think some of the best places are to pick up good leather, take a look at my previous post about sourcing leather (click here). I’m not the best at digital fabrication (yet), but I keep trying to learn new things. This one is a pretty simple file, and I used some free software, Inkscape, to create it. Inkscape is vector software, the counterpart to Adobe Illustrator, and it has a lot of features, many of which I don’t know how to use yet. This one is just a simple square, and then some ovals along an inset square for the stitch holes. Then, I just centered my logo in it, and made all of these things a different color in the file. 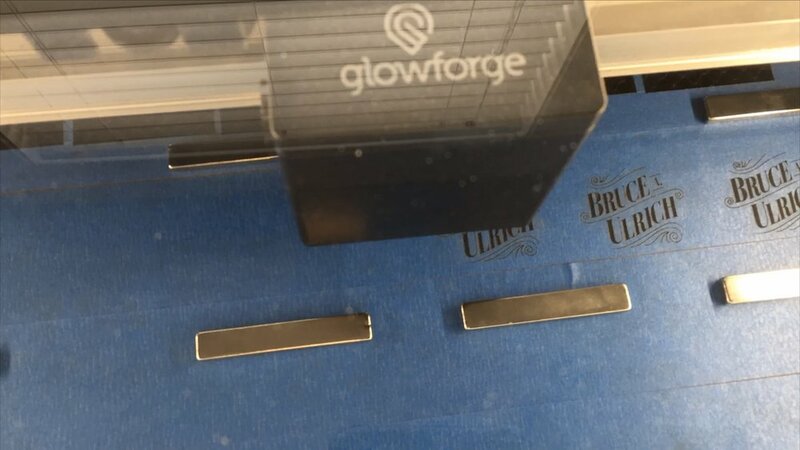 The Glowforge can be set to do different operations for different items in the same file by simply making them different color. That’s all I’m going to go into the digital part for now. If you want, I might revisit this and get more into details about how I created that. Leave me a comment and let me know if that is something you’d be interested in. When laser engraving, there are many settings you can change to achieve what you want. You can change the speed and power, and combine those almost infinitely. So, how to you get just the right engrave or cut? Lots of trial and error. Lots of testing will yield you with some good results. I have the Glowforge laser engraver, and they sell materials called Proofgrade. They are very good quality materials (acrylic, leather, plywood, hardwood) with masking on both sides already. The biggest benefit of Proofgrade materials is that Glowforge has already done the testing for you. They’ve already figured out the best cut and engrave settings, and have it printed on a QR code right on the material. When the machine sees this, it automatically sets everything for you. All you do is import your file, tell it what to cut, what to engraver, etc…and it does the rest. I didn’t use Proofgrade materials though, so I still had a lot of testing that I did. It would have been nice to use Proofgrade, but I already had so much leather, it just made sense to use that. Most leather end products have the edge burnished in one fashion or another. 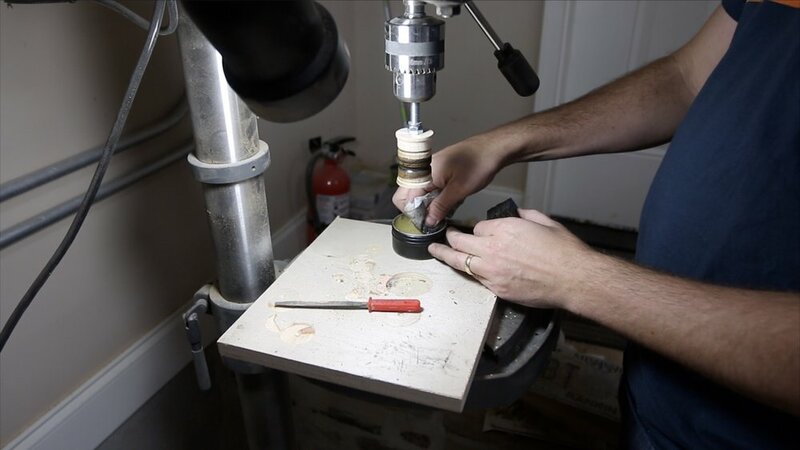 What exactly is edge burnishing? Well, you just create some friction with some kind of medium on the edge of the leather. Sometimes, this can be water and other times, you use another agent to cause this heat to build up and kind of polish the edge. I used my mineral oil and beeswax finish that I made from scratch. It seemed to work the best in some tests I did, so I went with that. I would just apply a little bit to the edge of the leather, and then hold it up to the burnisher and run it across back and forth, until I felt like it was sufficiently burnished. I made a homemade burnisher for my drill press by taking a wooden spool and a carriage bolt and a lock nut and just creating one myself. I put all of that together and then put it into the spindle of my drill press. Then, I used a round file to create a groove in the spool. I might turn this into a mini project or video, so stay tuned on more details for that. I’m really pleased with how it worked out. Now, it was time to stitch to hats. I have gone over this in more detail in past posts, so if you want to know more about the stitching process, check out this post. It tells about one of the most basic leather stitches, the saddle stitch. I wanted to use the saddle stitch, but for this particular application, it would just not work. As I tried to put the needle and thread through the same hold with both needles, it was just too much. There were just too many layer s of material and leather to get through. I opted for a simple over and under pattern that would work just fine. And I might add…it turned out looking really good! 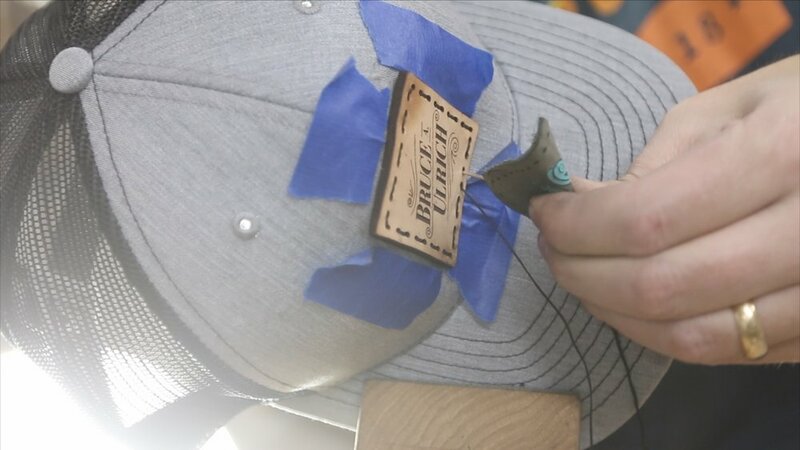 To start, I clamped the hat’s bill in the stitching pony that I made, and then put the needle through from the front of the hat to the back/inside. I started about 3 holes forward of where I really wanted to start. I was doing a little bit of a back stitch to start it off. That locks in the thread and makes it where you don’t have to tie a bunch of knots. I would just come from the front of the hat inward to the inside of the hat. Then, I would skip over to the next hole and come up from the inside of the hat to the outside/front again. I continued this all the way around until I was finished. At the end, I stitched through to the inside of the hat and then tied a couple of simple knots. That way, they were out of the way and didn’t affect wearing the hat. I used a lighter to burn the ends of the thread and keep them from running. The trucker hat that I did, I actually gave away to someone who followed me on Instagram. That really is the place I’m most active, so if you don’t already follow me there, I’m @Brudaddy on Instagram. (I’m late posting this written article this time so that giveaway is already over. If you’re just now seeing it…I’m sorry. I’ll give more notice for my website people next time I do a giveaway.) 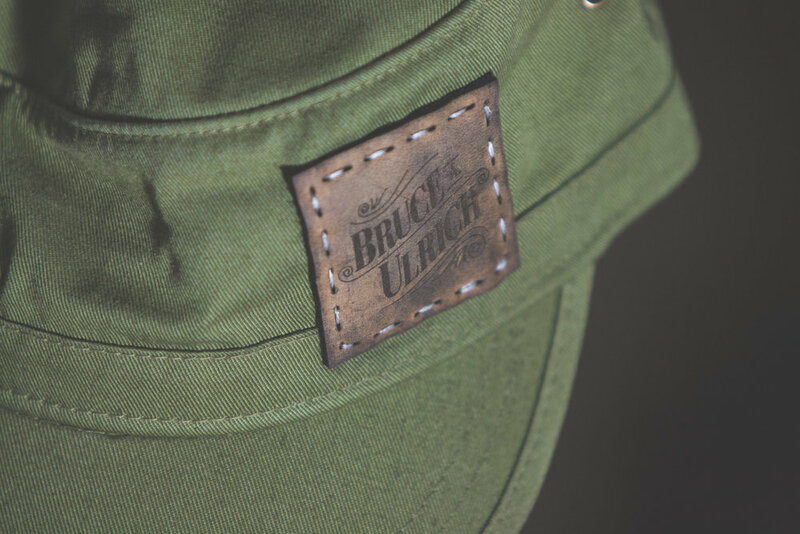 The trucker hat was incredibly difficult to stitch. I’m not sure what was in that bill, but the material would not really allow me to push the needle through hardly at all. I ended up having to use a scrap piece of leather as a thimble, so the needle would not dig into my finger. The “cadet” hat was a lot easier to stitch, since it was not so rigid on the front of it. I used a lighter to burn the ends of the thread so they would not fray or run. Be careful not to light your hat on fire! Just a few touches were left at this point. I got some of my mineral oil and beeswax finish and rubbed it into the veg tanned leather. This just gave a little more color to that particular type of leather. I will be putting together an article and video about making that beeswax finish soon, so be on the lookout for that. Overall, this was a fun learning experience. I enjoyed the problem solving I had to do in order to get the laser to cut properly on multiple different pieces of leather. Also, the different experiments with edge burnishing were very enlightening. Stitching the hats was a great experience too, since I’ve not stitched that many things up to this point. It was so cool to be able to hand these out to people at Workbench Con. They seemed to really enjoy getting something a little different than most of the other logo stickers. I’d love to know what you think. Which hat would you me more likely to wear? What in particular did you find interesting about this project? Let me know below, and I’ll see you on the next project!